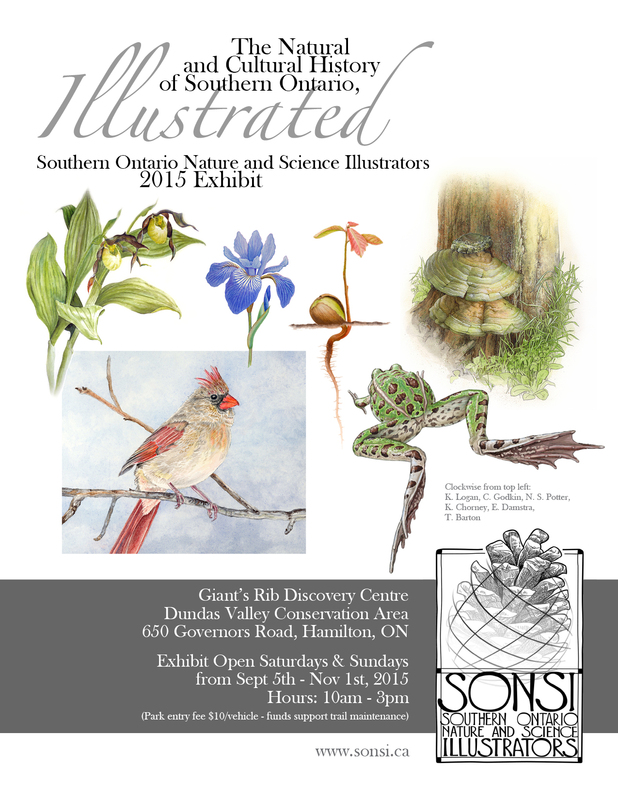 Once again, I’m participating in an exhibit with the Southern Ontario Nature and Science Illustrators. This year, our exhibit is hosted by the Giant’s Rib Discovery Centre, the same place that now displays my recent illustration of three different Silurian environments of Southern Ontario (see previous post). More details about the SONSI exhibit are here. Please note that the exhibit will NOT be on display the weekend of September 12/13 due to an event that the Centre is hosting. Our exhibit reception will take place on October 17, coinciding with a somewhat informal “Grand Reopening” of the Giant’s Rib Discovery Centre. Anyone who wishes to see the newly redesigned GRDC, view the exhibit, and speak to the artists is welcome to show up anytime after 10 AM. Enjoy some refreshments in the morning and see the artwork. Artists will be participating in a hike from about 10:30 AM to 12:30 PM, after which there will be opening remarks and lunch (kindly provided by the GRDC), followed by more time to socialize and see the displays. Please join us! Congratulations, Emily! And SUPER nice frog! Complete mastery of an unusual viewpoint . . . in action, no less!